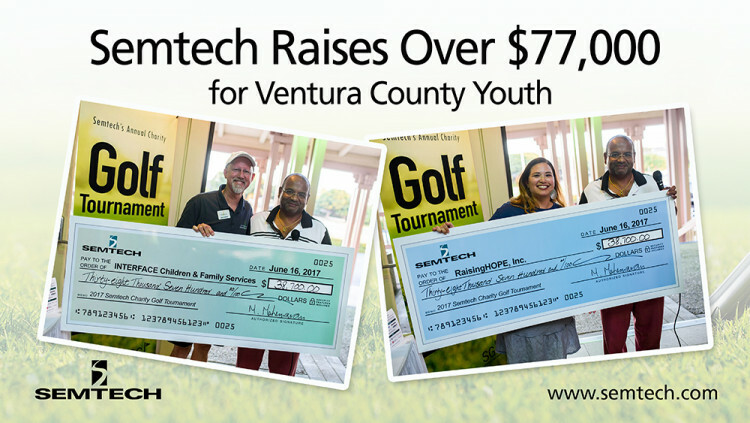 CAMARILLO, Calif., June 21, 2017 - Semtech Corporation (Nasdaq: SMTC), a leading supplier of analog and mixed-signal semiconductors, hosted its fifth annual charity golf tournament on June 16 at the River Ridge Golf Course in Oxnard, Calif. The two charities, Interface Children & Family Services, and RaisingHOPE, Inc., will divide the $77,000 in proceeds, a 39% increase from last year’s fundraising effort. Each foundation is focused on helping children and families in need of support and mentorship. Sponsors for this year’s charity golf event included O’Melveny & Myers LLP, Deloitte & Touche, King & Spalding LLP, and Alliant Employee Benefits. For the past several years, Semtech has hosted employees, family and friends for a full day of festivities, including a putting contest, a shot gun-style golf tournament, a silent auction and raffle, as well as a dinner and award ceremony. To date, the charity golf tournament has raised over $212,000 for Ventura Country charities including Big Brothers Big Sisters of Ventura County, RAIN Communities, Inc. and Casa Pacifica. RaisingHOPE, Inc. is a non-profit organization that provides advocacy, awareness, funding and support for children and families in the child welfare system as well as dependent children, non-minor dependents, parents of dependent children and foster parents or relative caregivers. Interface Children and Family Services is a non-profit social services agency, providing 24,000 local clients assistance in areas of mental health services, youth services, family violence intervention, justice-involved families, and community development.